Decision Tree Software gives you a plethora of metrics for a decision tree. You can choose the metric you want to see in the Options analyzer carousel. Say, you have created the following decision tree. Now, if you expand the Options Analyzer tab, you will see you can choose lots of metrics to display in the chart and the metric table. The metrics are made available based on the decision context. 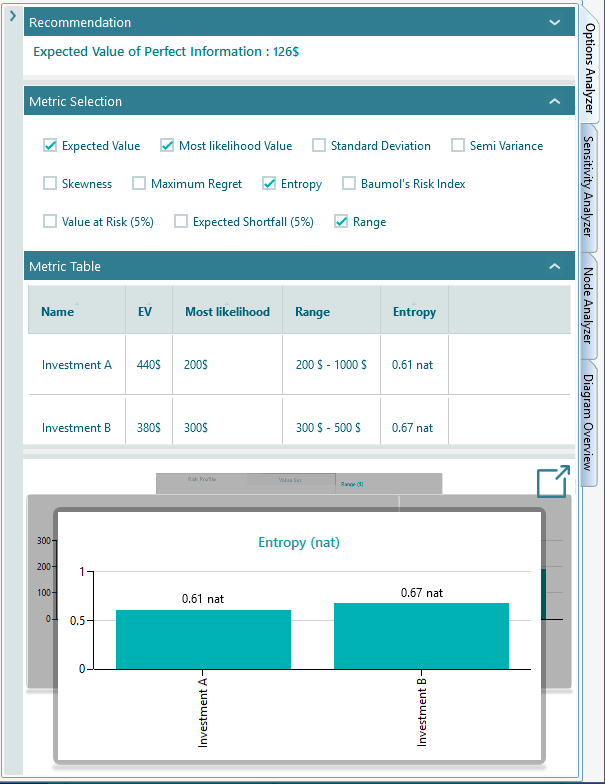 For example, if a decision tree does not contain any uncertainty (chance node) then uncertainty/risk related metrics will not be visible in the Metric selection panel. Usually, the following metrics are available to display in the metric table and charts carousel. The expected value is the metric calculated by the following formula. The expected value chart shows the metrics as shown below. Most likelihood value is the value that has the highest probability to occur. 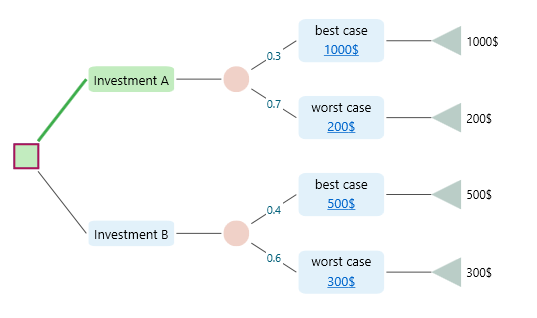 In a decision tree as shown below, for the Investment B, the most likely value is the Worst Case outcome because, in the chance node, Worst case has the highest probability (0.8) among all events within that chance node. A standard deviation is a measure that indicates how the values of an uncertain outcome are different. For example, in class A, if the students' exam scores are 50, 58, 55, 52, then we can say that their scores are very similar and variation is very low. On the other hand, in a class named class B, if the students' exam scores are 10, 100, 70, 40 then we can say there is very high variation among the scores. The average score of class B is 55. The average score of class A is 53.75. If we just compare the average, we will think that class A is doing better. But, looking into the score of class B, we can see that class B is actually consistent and all students are performing almost similar. If the low variation is important for you, then only average won't give you the correct picture. You need a metric that can tell you how the values are dispersed. Standard Deviation is the metric that can tell you that. When the outcomes are uncertain, we call the outcome as a Random variable. The standard deviation of random variable X is often written as σ or σx. Here, x is a Random outcome, P(X = x) is the probability of the random outcome x. E(X) is the expected value. Where xi is a random outcome, P(xi) is the probability of the outcome xi. A is a threshold constant such that payoff less than A would be considered as a failure. For example, you might have an aspiration level for getting a certain salary when choosing a job. If a job pays less than a certain amount as a salary, you will not even think about that job offer. 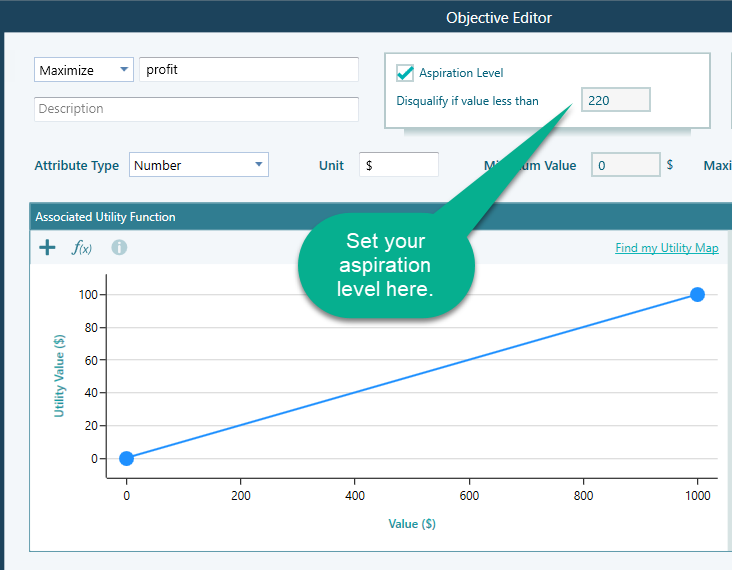 How to set your aspiration level in the Decision Tree software? You can open the Payoff popup and double-click the Criteria to open the objective editor. The Aspiration level can be set only for Number and Monetary type objective. 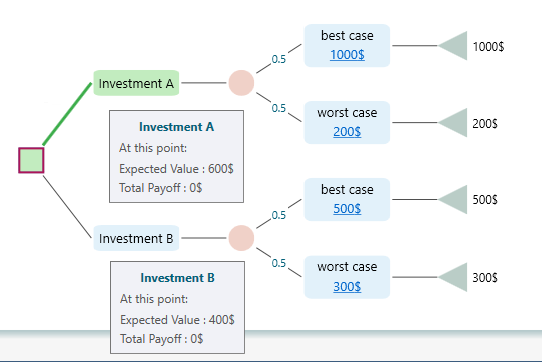 If the aspiration level is not set, then the Decision Tree software will consider the Expected Value to be the aspiration level and it will calculate the semi-variance using the Expected value as the aspiration level. If you have more than one objectives, then naturally every objective may have its own aspiration level. Then, it is not meaningful to calculate a Semivariance based on any single aspiration level, right? 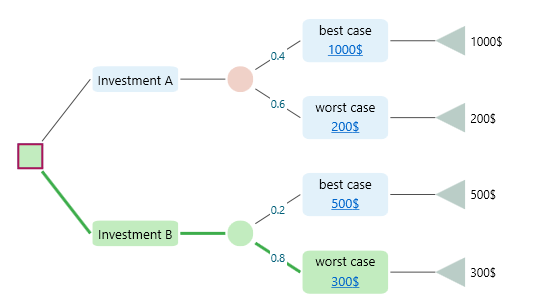 Therefore, the decision tree software will use the Expected Value (or Expected Utility) to be the aspiration level and the semi-variance will be calculated based on that Expected value as aspiration level. Maximum regret is the metric that indicates, if you choose an option, at maximum how much you can regret by not choosing other options. It is discussed in details in the Decision Criteria page. Where E is the Expected value, σ is the standard deviation, and k is some constant selected by the investor representing his/her safety requirement such that the return is unlikely to fall below it. In the decision tree software, the "k" is calculated from an input named "significance level". This significance level is the same concept used in 'Value at Risk' calculation. The probability of a payoff below E - k .σ is bounded by 1/k2. Therefore, the value of k can be calculated based on the significance level. 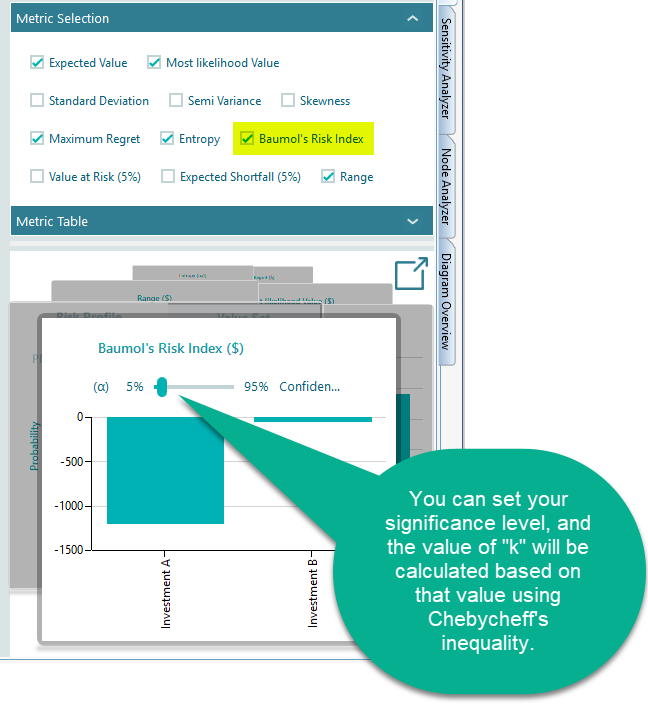 The software will ask your significance level α in the Carousel when you select the Baumol's Risk measure metric. Where 'd' is the aspiration level. 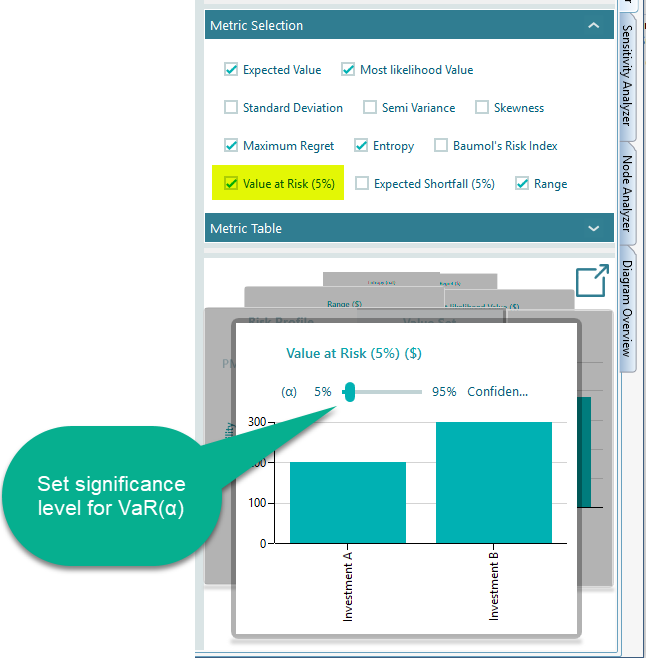 In the section of "Semi Variance" metric, we have explained how to set the aspiration level for an objective. Once you set the aspiration level, you will see the metric "Roy's safety first rule" available in the metrics panel. When you watch a movie, if you can predict the sequence of events, then you do not feel any suspense and eventually, do not enjoy the movie, right? How do you measure the suspense of a movie? You will say, the less you can predict, the more suspense you will feel. Right? That is the idea of Entropy. Entropy is a metric that measures how less you can predict from random variable outcomes. "Probability" measures how likely one uncertain state can occur. And the Entropy measures the degree of uncertainties in a Random variable. A Uniform Probability Distribution has the highest entropy because every possible outcome in that distribution has an equal chance to happen so you will always be in suspense with a uniform probability distribution. But what about a Normal Distribution? Using a normal distribution, outcomes are highly predictable around the Mean, so a Normal Probability distribution has a lower entropy than a uniform probability distribution. Where b is the base of the logarithm used. In the Decision Tree Software, we used the base = Euler's number e. The unit of entropy with base e is "nats". You can choose the metric "Entropy" and display the chart same like other metrics. Value at Risk expressed as VaR(α) is a common risk index used by practitioners and in particular by financial institutions. Say, you have an uncertainty where the events have the following probability distribution. It is defined as the maximum dollar amount expected to be lost at a pre-defined confidence level. 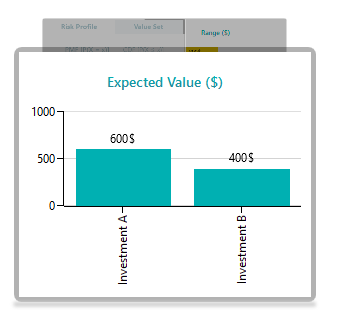 In the Decision Tree software, you can choose to display the Value at Risk metric from the metrics panel. Then the chart in the carousel will let you set a level of confidence or significance level (α) as shown below. 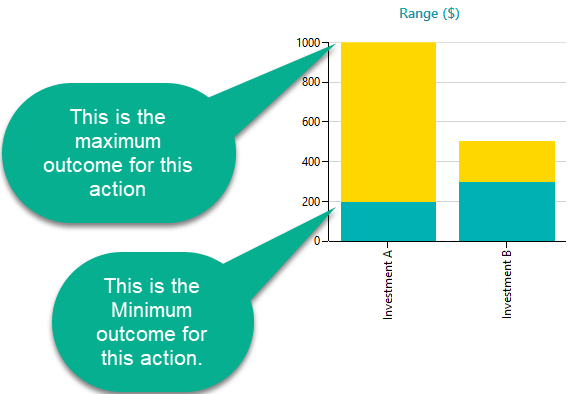 A Range chart shows the Minimum Possible value and the Maximum Possible value of an option as a range. Looking at the range chart, a decision maker can quickly understand the risks and expectations, and then he/she can choose an option based on Maximin/Leximin criterion. The Range chart also helps the decision maker to understand the dominance among options. Which option dominates another option either deterministically or stochastically.